I highly recommend Du Vall for your lawn care needs. They do a great job consistently, and text in advance of service date. Their communication is excellent...they are easy to reach, friendly, and our yard has flourished under their treatments! Duvall Lawncare is a gem. They know how to focus on the customer's need. After communicating with them I what I needed for my lawn, they were able to create a plan that would bring my law to a pristine green without weeds. It worked in a very short time. This is the fourth season that I have used them on a regular and routine basis and they have exceeded my expectations. At every area of the company from the lawn professionals to the office staff. They are professional and very kind. They get the job done and I'm very pleased and satisfied. Bill, it's our pleasure to serve you! Thank you for being a satisfied customer. I'm thankful for the DuVall team for keeping my lawn green and beautiful without my ever having to worry about it. The guys go the extra mile to make sure I understand my services and that I feel comfortable with everything they propose. They even help me get rid of the darn moles that invade each year! 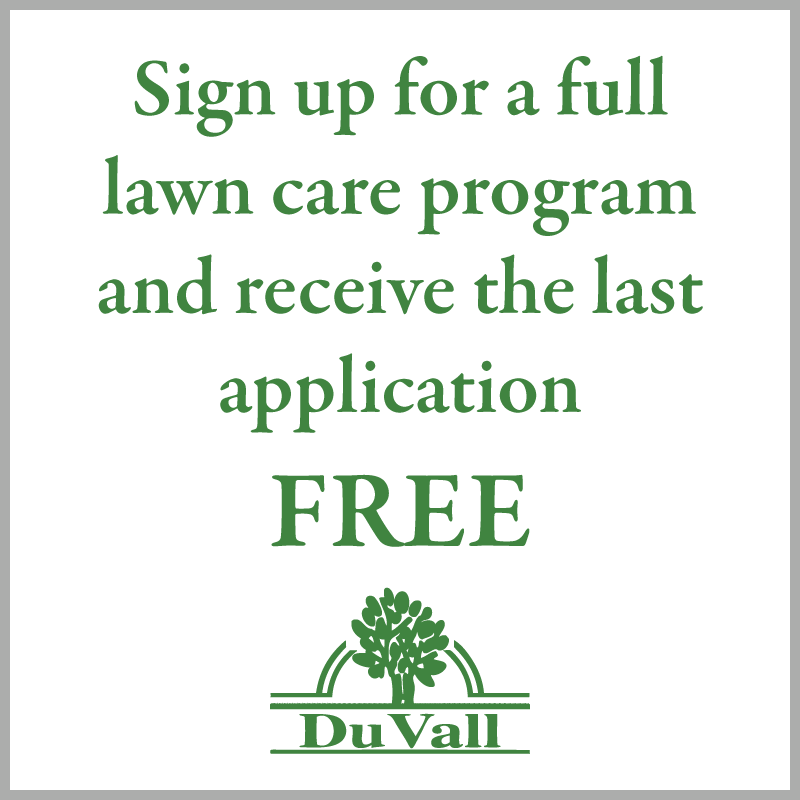 The DuVall team is a great choice for your lawn care needs. Carol, it is our pleasure to be caring for your lawn. Our main focus is making sure our customers know what we are doing and they are satisfied with our work. We are glad that we did a mole treatment, they sure can mess your yard up fast. We appreciate the time that you took to write us such a awesome review!! It has been a great experience working with Duvall lawn care. Our yard looks wonderful and they are always so nice to work with..
Stacey, we are pleased to hear that you are happy with the way your lawn looks and with our great customer service. Thank you for taking the time out of your day to write us a review. Shortly after moving into our home we researched many different lawn care services. Selecting DuVall was an easy choice due to their personalized service, competitive rates and high quality products. Four years later, our lawn, flower gardens and landscape are pristine, healthy and enduring. Haven't seen a dandelion in years. 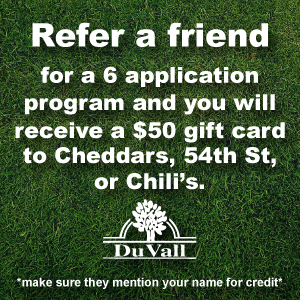 Each time a new neighbor moves in we tell them to contact Duvall. We could not be happier. I trust their work and strongly endorse them. Michael & Shelly, we are very happy that you choose us to care for your new property. So pleased to hear that your lawn is up to your standards and has no weeds at all. We can't thank you enough for putting our name out there. The time that you took to write such a wonderful review means so much to us! Truly exceptional service. Always accessible. Very reliable. and prompt If they say they will show up, they do! I never have to supervise what they do, and it is always done to an excellent level! Rohtash, thank you for such an amazing review! We are pleased to hear how you put trust in our applicators, our goal is to satisfy our customers. We are on our third year with DuVall Lawn Care and have been well pleased with our lawn results. DuVall is quick to respond to any questions or concerns. I also appreciate that they are not always trying to sell you an additional service or application like some lawn service companies that I have used in the past. Money well spent for their services. Larry, we are here to make sure that our customers are enjoying their lawns and our customer service. We love to hear feed back. We couldn't be more happier to hear your amazing review. Thank you! We have used Duvall for over 2 years and our yard our yard has never looked better. Thick, green, weed free and affordable pricing. Anthony, this review makes us feel great about what we do. We are happy to hear that you are satisfied with your lawn. We take pride in taking care of our customers. Thank you! Have used DuVall for several years and my yard looks great. Employees are very courteous and helpful. Would highly recommend to anyone. Tyson, we are glad to be servicing your lawn for so long. Satisfaction is what we work for. We will give back to those who recommend us, thank you for your great review!